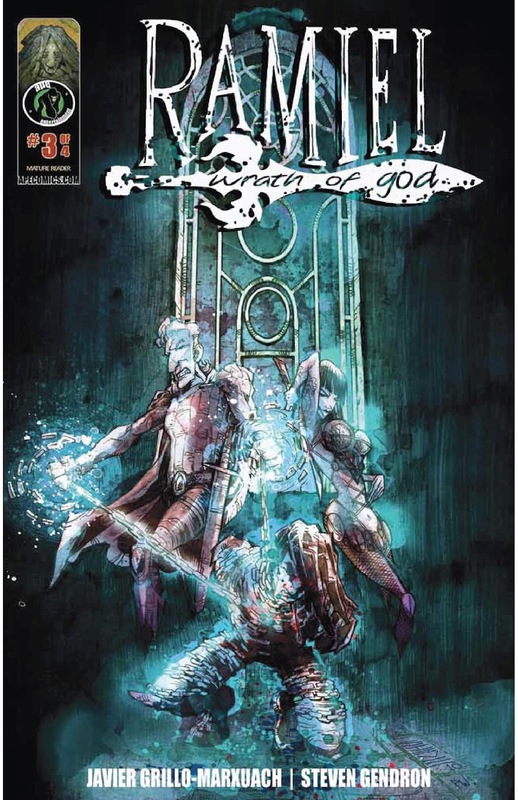 The Fellowship was fortunate enough to obtain a copy of RAMIEL WRATH OF GOD #3 from Ape Entertainment. The story is by Javier Grillo-Marxuach with art by Steve Gendron and colors by Peter Wonsowski. Ramiel (the angel who has come to Earth and become flesh and blood) rescues Molly, but is wounded in the process. To her amazement, she is able to heal him. Ramiel takes her to Father Donoan who is skeptical of him, until Ramiel reveals all in one touch. Ramiel leaves to confront Detective Dumont and makes him see the error of his ways. He then finds a bum who witnesses the murder of Molly’s husband. With a single touch, Ramiel unburdens the bum’s mind hoping he would do the right thing. Ramiel is ordered to return to Haven as a war is eminent, but he refuses saying that the war is happening on Earth. Ramiel is restrained, but escapes in order to continue to protect the world. This is a different take of the “angel on earth” concept, which is great. I am not familiar with Grillo-Marxuach’s work, but the art is uniquely awesome. What really blows me away is Gendron’s use of watercolors. It’s non-traditional, carefree and very striking. Not sure how this story ends, but I’m sure it will be good. RAMIEL WRATH OF GOD #3 is in stores now and available at www.ApeComics.com.